In my article two weeks ago, I said that you would be fairly confident of picking Vern Cotter's starting team for their opening Six Nations fixture against France. So is the fact that the team is predictable a positive or a negative? Regarding the Welsh XV, Warren Gatland certainly sees it as a positive as he smugly named his side 48 hours before he had to. Revealing a settled team was another ploy to get under the skin and unsettle the English. The idea? To highlight that Stuart Lancaster was still unsure of his best combinations despite only being seven months away from the World Cup, whereas Gatland knows exactly where he is with his squad. Back to Scotland, though, and I think it's generally a big positive. Moving forward to the World Cup, you wouldn't see too many changes, barring injuries, and this will allow the team to develop together and gain precious experience. My one issue with the side is that there will be a few ring-rusty players. Euan Murray, Stuart Hogg and Rob Harley haven't played in a month, and Mark Bennett has only been back for a game and a half since his November Test injury. They are a key quartet for Cotter, though, and you can totally understand their involvement. I just know it takes a little time to get into your rhythm after an absence and France in the Stade de France is not a scenario that will afford you a bedding-in period. I'm pleased with the inclusion of Johnnie Beattie. It's vital for Beattie, in particular, to get early touches on the ball - he needs to be involved and functions best when he is relied upon and looked to to inspire the team. He has a point to prove, too, having been left out of the original squad. I expect a big performance from him. France will be fired up. Emotion is a key ingredient of the French psyche and, with the terrible memories of the events of 7 January in Paris still fresh in the minds, they will use this opportunity to unite the country. Coach Philippe Sainte-Andre has already spoken of it. During my time with Brive, I experienced first hand the positive effect of emotion on the team's performance. In the same week, a former player was paralysed playing for his new team when a scrum collapsed and a team-mate was diagnosed with cancer. The response of the players was phenomenal - they were like men possessed, the win was huge, and all the talk was about doing it for Alexandre Barozzi and Olivier Caisso. I think the French will play off the emotion and produce some fireworks. The chat from French journalists is that they are happy that - at last - Sainte-Andre has selected the best players available to him. So how do Scotland deal with this? Pressure is the key - relieving pressure on yourselves but creating pressure on France. Scotland have threats all over the pitch but the reality is you don't score every time you touch the ball and to frustrate the French you must put phases together and then manipulate the defence. They need to build on the general ambition from the autumn Tests but zone in on individual weaknesses. I'd be getting Mattieu Bastareaud to make decisions in defence, whether to step in or to the slide. Have options around him. Please, for the love of God, don't run straight at him. Ouch! Create pressure on France by not giving them field position or easy yards. The French 'demi d'ouverture,' Camille Lopez, is one of the most talented players you will come across, with a pin-point, left-foot cross-kick his trademark, but he can be flaky too. I'd suggest Rob Harley could clumsily welcome him to the game with a couple of flying charge-down attempts to soften him up and put him off his game because, with time, he's a genius. France: Scott Spedding, Yoann Huget, Mathieu Bastareaud, Wesley Fofana, Teddy Thomas, Camille Lopez, Rory Kockott; Alexandre Menini, Guilhem Guirado, Rabah Slimani, Pascal Pape, Yoann Maestri, Thierry Dusautoir (capt), Damien Chouly, Bernard Le Roux. Replacements: Benjamin Kayser, Uini Atonio, Eddy Ben Arous, Romain Taofifenua, Loann Goujon, Morgan Parra, Remi Tales, Remi Lamerat. 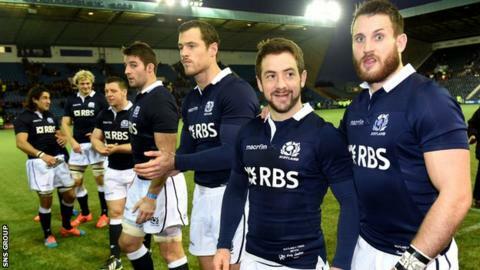 Scotland: Stuart Hogg; Tommy Seymour, Mark Bennett, Alex Dunbar, Tim Visser; Finn Russell, Greig Laidlaw (capt); Alasdair Dickinson, Ross Ford, Euan Murray, Richie Gray, Jonny Gray, Rob Harley, Blair Cowan, Johnnie Beattie. Replacements: Fraser Brown, Gordon Reid, Geoff Cross, Jim Hamilton, Alasdair Strokosch, Sam Hidalgo-Clyne, Peter Horne, Dougie Fife.